From the time the partners acquired this salmon camp on the Restigouche River we have been focused on a gradual transformation of changes and upgrades to the structures and grounds. RRL guests returning each season are witness to these changes. Though the years we have and will continue with the projects and upgrades that will enhance the visits of our guests and owners alike. The accommodations at the Restigouche River Lodge offer these features. A main dining lodge, a premier guest lodge, a two bedroom cottage and a three bedroom guest camp. With the different layout of the camp buildings we are able to offer our guests, family or group bookings many lodging options. A special dining experience is served three times daily in our main lodge, said to be the best dining on the Gaspe. At the Restigouche River Lodge we are fortunate to benefit from the gradual building changes that has left a unique footprint to this salmon camps layout. Our main lodge serves not only as a dining lodge, it is a place for our guests to mingle. Mingle 24 / 7 coffee, tea, cold drinks and baked delights are always at hand. When a guest wants some quite time he or she needs only to stroll back to their cottage for some personal time. In the lodge you can relax with a choice beverage and warm up by a crackling fire. Take in the beauty of the Restigouche River, a spectular upriver view of Home Pool is on the canvas from the screened veranda. Welcome to our premier lodging on the Restigouche River, finest lodging on the Gaspe. The partners have spared no expense in the construction of this camp which is available for single or couple occupancy. The camp is constructed from cedar logs, metal roof and was custom designed to provide the RRL guests the finest comforts. The camps front side faces Restigouche River Road were guests first enter. The entrance is center of the building and the front door leads to the rod room where you can stow away your fishing gear. 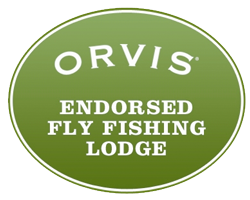 Our rod room features a rod rack which accommodates your longest spey rod. Individual open guests lockers, a dry room and a back door leading to the stairs down to the river. Bed rooms run front to back, two per each side of the rod room. The camps front porch is covered for the entire length of the camp and features a peaked entrance. Entering your room through the front foyer is a private bath and a large guest closet. 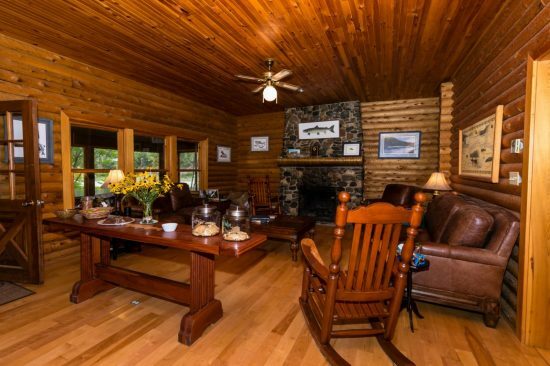 The rooms, solid wood throughout feature high pine ceilings and tamarack floors. 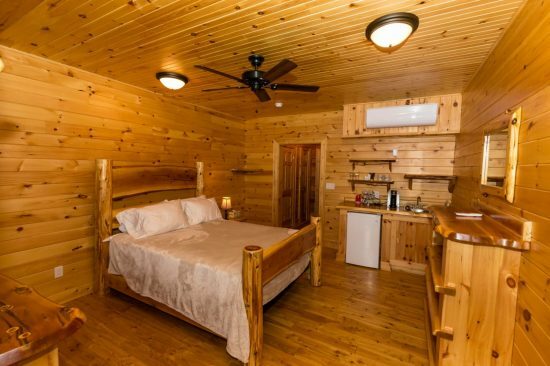 All the furniture from the queen size log bed are RRL custom designed and built of local white cedar. Your room features individually controlled heat and air conditioning systems with an over the bed ceiling fan, affording you the most comfortable room temperature. In addition to all the fine appointments you have the convenience of a wet bar, fridge and coffee maker. Exiting your river side door, is a shared screened veranda, a wonderful place to relax looking over the Restigouche. Feel pampered with a cool drink or morning coffee under the gentle breeze of a ceiling fan. 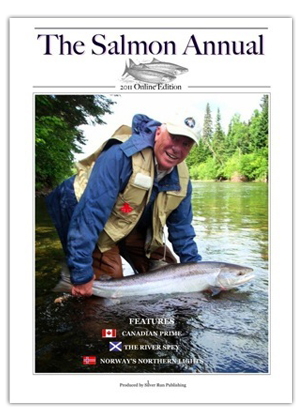 It is our quest to bring the true Atlantic salmon lodge experience from yesteryear to our guests. We have surrounded this camp with perennial gardens, beds of roses, peonies and other fragrant flowers. Stroll the winding gravel pathways through this garden. Your journey from the upriver side of the Highland Camp brings your through this hillside garden. Walking the path through the garden you will cross a small bridge and a babbling brook on the way to the dining lodge. Stop and take in all that nature has to offer at one of the garden benches along the way. On your way you might stop to meditate by the lower pond, watch the birds and let your hectic life dissolve into the peaceful surroundings of the Highland Camp Hillside Garden. Camp Head sits on a slight bluff overlooking the Restigouche River just down river from the Guest Camp. A short walk across the foot bridge brings you to the Lodge. This cottage is believed to have been constructed in the late sixties and has served as the owner’s camp for the prior owners. It is the perfect family accommodation, sleeping four guest with two baths and a large living area. There is a screened porch that serves for rod storage and as a changing room to get in and out of wet ear. From the time of King Grants this section of water had been leased to others by a succession of owners. 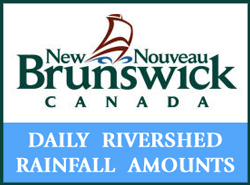 The camp was constructed when one of the unknown prior owners began fishing this section of Restigouche River water. The camp has gone two major construction additions over the years. This camp serves the RRL well as a larger six guest accommodation. This is our closest camp alongside the Restigouche and guests can keep an eagle eye on Home Pool. Three bedrooms all with private baths and a large living area are the features of this camp. We like to think that our grounds are part of our guest’s accommodations. Inside or out your stay with us is a complete experience, from when you wake, till you lay your head on the pillow at night everything the RRL has to offer is yours. 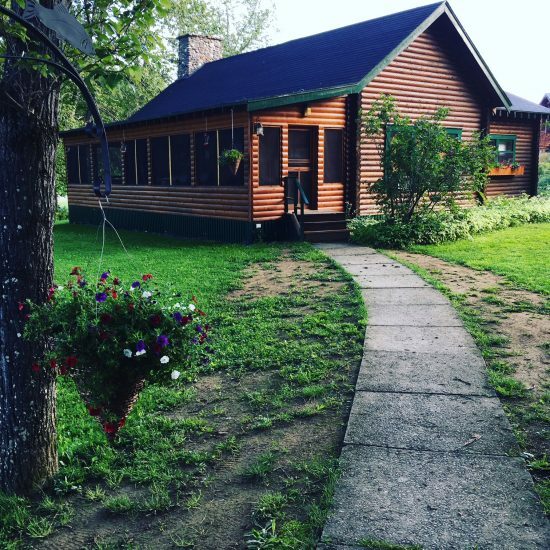 Aside from all the Atlantic salmon fishing spend some time in the tranquility of gardens at the Restigouche River Lodge. Our fire pit is ablaze pit and greets you in the evening after fishing. Take few moments and warm you soul before joining the rest of the guests for our late “lite meal.” It is our mission to enhance every minute of your stay with us at the Restigouche River Lodge.